Welcome to the Epson Logo Store by First Image! Our website is dedicated exclusively to Epson logo-identified merchandise and offers a wide variety of in-stock, quality and innovative products to help support and grow your business. Logo-identified items are excellent tools to create exposure, make great thank you gifts, and provide excellent mementos at trade shows, business seminars or other promotional events. Please take this opportunity to explore all that we have to offer. Depending on specific minimum quantities, most of the items on our website can be customized to include Epson affiliate’s and Epson partner’s logos. If you do not see what you are looking for on our website, please call First Image at 817.361.9807. We will ensure that all of your promotional product and sportswear needs are expediently met. Send us an Email (info@firstimagestore.com) if you don't see what you need, or if you need help to customize your order! 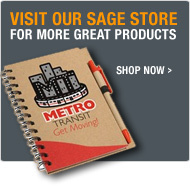 In addition to the items available on this site, we are pleased to offer promotional items from our Sage Store.